As I’ve done occasionally throughout the offseason, we’ve traveled back through time to look at the early days of the Pittsburgh Steelers. It’s a topic that, I’ll admit, isn’t for everyone, and given how annually bad they were, takes a special kind of insanity to want to hear about. We’re doing similar this year, recapping the 1934 year using accounts from The Pittsburgh Post-Gazette and The Pittsburgh Press. Keep in mind this team was dubbed the Pittsburgh Pirates, not changing to the Steelers until 1940. We will refer to them as such for the article. Let’s go back in time, beginning on September 9th, 1934. 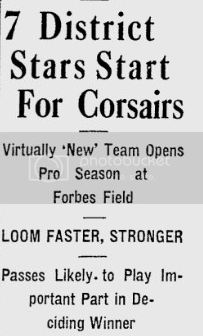 Coming into the season, The Press hailed the Pirates as a “new team,” shaking off the memories of a 1933 club who went 3-6-2. They used terms like “faster” and “rangler,” whatever that means. I wonder if 1934 Warren Sapp would have taken credit for telling the team to stop being old and slow. With new head coach Luby DiMeolo leading the charge, the 1933 headman Jap Douds still played on the team, for the record, a new philosophy was introduced. The Pirates would switch from a two wing to a single wing attack. As an aside, if you follow Steelers’ history, they would be the last team in the NFL to abandon the single wing, and a source for why the team struggled in the late 30’s to early 40’s. The “new” element of the team were the names. Only a few from the 1933 club remained: Cap Oehler, Bill Sortet, and the once highly touted Angelo Brovelli. Gone were Paul Moss, Tony Holm, George Shaffer, etc. But this 1934 version wasn’t new to fans. A reported 16 of 27 roster spots were occupied by a local player, several of them from the University of Pittsburgh. Your 1934 Pittsburgh Pirates offensive starting eleven. Heller threw darts to Smith and Vaughan late in the first quarter to get a drive going. It continued into the second with Vaughan receiving a lateral and firing it to Sortet for 24 yards down to the Reds’ 20. They moved to the five as Heller and Vaughan hooked up once more but there, the drive stalled, and the Pirates turned it over on downs on Cincinnati’s two. 1934 or 2014, it doesn’t matter. There were red zone problems. They would break through on the next drive. Alex Rado had just eight completions on the year but one of them went to Vaughan for 14, down to the Reds 27. The paper describes it as a “forward-lateral” to Jimmy Clark, his only career catch, for a 27 yard score. 37 year old Mose Kelsch converted the extra point, the crowd “roaring” for him as one of their favorites. 7-0 good guys. Vaughan muffed a punt that gave the Reds their best scoring chance right before the half but the Pirates’ defense rebuffed them to keep it 7-0 going into the break. It was the second time the defense tightened up, also stopping them on the three early in the first quarter. The third quarter was scoreless. Pittsburgh kicked two field goals in the 4th, the first by Kelsch in large part to a 31 yard hookup between Heller and Smith. It capped off a 75 yard drive. Niccolai had the other to round out the tallies. The game started at 3 PM and Oehler, considered a veteran in those days, served as the team’s captain. Between 14,000-15,000 fans packed Forbes Field to watch. Some screenshots from the newspaper’s articles recalling the game. This Pirates did a good job of bottling up the Redskins but ultimately, didn’t have the muscle on offense to win. It wasn’t for a complete lack of offense, either. Heller and the gang drove from their 22 to the Redskins’ 4 but was picked by Ernie Pinckett, ending the chance. Another opportunity was squandered in the second. Heller found Smith for 15 and Skladany for 30. The drive ended at the 17, bringing out Kelsch, but his field goal try missed. Since the turnover rate was high, it was common in those days to see teams punt before fourth down to avoid poor field position situations. That happened in the third quarter when the Pirates punted on third down. 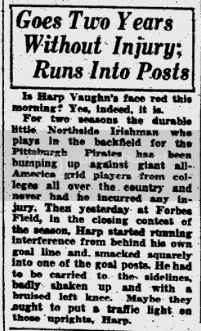 But Cliff Battles, one of the most talented and underappreciated backs of his era, countered with a 27 yard punt return to set up shop on the Pirates’ 28. 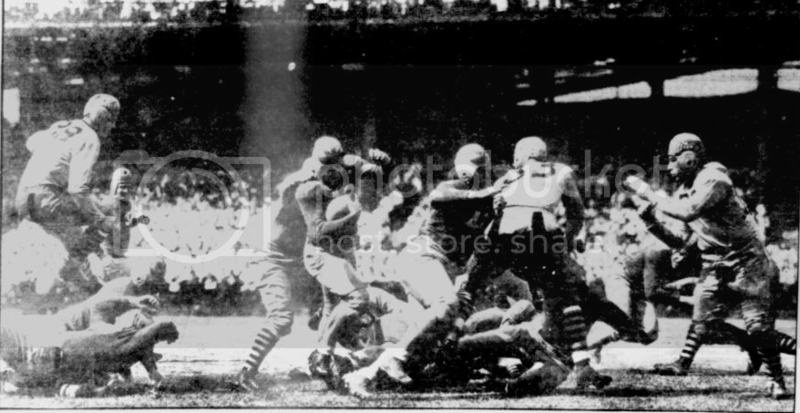 On the next play, Charley Malone hauled in a touchdown despite Vaughan and Rado draped over him. The extra point was good and the scoring would end there, Boston winning 7-0. Slightly over 17,000 fans attended. The headline could’ve been a little bit more engaging. Just under 12,000 folks watched the Pirates drop to 1-2 on the season. Thomas “Swede” Hanson was the Pirates-killer, scoring touchdowns in the second and third quarter. Luck wasn’t on the Pirates’ side that September day. On one of the Eagles’ scoring drives, Rado deflected a ball intended for Hanson. Paul Cuba, curiously listed as a tackle and never credited for a reception in records, was reported to have grabbed the pass in the air for a 15 yard gain down to the 20. Three Pirates were injured on a single play early in the game. It seemed innocent enough, Eagles’ running back Ed Storm taking the handoff. But by play’s end, Ben Smith suffered a cut on his scalp – he wasn’t wearing a helmet – while Skladany and Niccolai has gashes on their hands, though The Press calls Skladany’s injury getting “kicked in the groin.” Tomato, tomato. On the first play of the second half, a lateral from Oehler to Brovelli – making his first start of the year – was off the mark and though the Pirates recovered, lost 15 yards on the play. Warren Heller returned the ensuing kickoff off the Eagles’ second touchdown to his own 46. He then hit Smith for a gain of 28 but the Pirates would advance no farther. The rain began to fall in the fourth quarter and the Eagles knew their gameplan, relying on the run to chew clock. They moved 34 yards, concluding in a field goal to make the final 17-0. Pittsburgh had one final chance to at least avoid the shut out after Oehler fell on the ball at the Eagles’ 18. But Heller was intercepted immediately and the game ended moments later. Fans and ownership alike were frustrated. 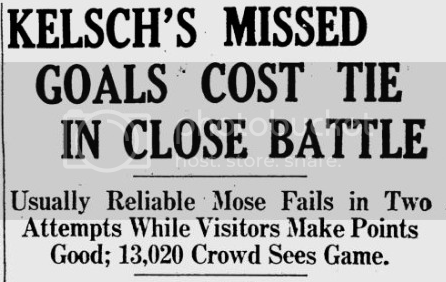 The Pittsburgh faithful, much like today, complained that certain players weren’t getting the ball enough. Fullback Sil Zaninelli had only one carry against the Eagles and just nine in the first three games. Art Rooney, according to The Post Gazette, was “disgusted” with his team’s play and threatened to release players if they didn’t get better. Of course, he had to regardless, with league rules mandating teams cut their roster from 27 to 22 in the middle of the season. I was never able to find concretely who those released players were like as I did for the 1933 team. Despite getting the luxury to play at home for the fourth straight week, the Pirates fell to the Giants. It was a valiant effort and a moral victory if there ever was one. The Giants would go on to be the world champs and the second-year club hung with them for the entire game. In fact, the Pirates led at the half 12-7. Before the game, DiMeolo made sweeping changes. Jap Douds was moved to guard, Zaninelli from FB to QB, placing Heller, Brovelli, and Rado in the backfield. Dave Ribble became a starting guard. Greeney was apparently benched or cut, the line between starter and off the team razor thin in 1934. The rest of the offensive line was unchanged. The Press’ Lester Biederman called it Muggsy Skladany’s “greatest ball game of his career.” Cap Oehler and others received high praise. An early Giants’ interception put them in business and they drove 37 yards, capped by a Harry Newman TD pass to Red Badgro. It was Newman’s only touchdown toss of the year. Some poor punting gave the home team life. Ken Strong shanked one, traveling a measly seven yards. But the Pirates went three and out and Niccolai’s 43 yard attempt missed slightly to the left. The Giants next punt was somehow worse. Kink Richards’ attempt went negative one yards. The Pirates wouldn’t squander another great opportunity. Heller found Skladany for a 28 yard score. The end made a great play, scooping a deflected pass up before it fell to the ground. 7-6, pending the extra point. That extra proved to be the difference in the game. Kelsch missed it wide right and the Giants still led. Heller put the Pirates back in the driver’s seat, intercepting a Newman pass at midfield. He fired to Ben Smith for 15 yards. Brovelli ran for eight. Heller again connected with Smith for 20 yards all the way down to the two. And then Heller did it himself, running from two yards out behind Skladany and Niccolai. Kelsch trotted out again but the extra point was blocked. 12-7 home team. After running out of time in the first half, getting down to the ten before time expired, New York came out firing in the third, driving 65 yards and capped it with a Strong six yard run. Their XP was true and the visitors led 14-12. Pittsburgh had one last drive in them, highlighted when Skladany had a sensational one-handed 38 yard reception into Giants’ territory. He finished the day with two catches for 66 yards. But Niccolai’s long field goal was wide right and the Pirates, again, would lose. The headline the next day painted Kelsch as the goat. It would be the Pirates second and final victory of the ’34 season. With the game on the road, the accounts are shorter and only the PPG’s write-up of the game was archived. It was a punting battle early on between Zaninelli and Swede Hanson with the Pirate given the slight edge. Maybe some hometown bias at play. Niccolai booted the only points of the first half, a 28 yarder in the first quarter. Alex “Pug” Rado had a key interception in the game, stalling an Eagles’ drive that led them deep into Pirates’ territory. Zaninelli did it with his hands in addition to his leg, picking off a pass in the fourth quarter and returning it to the Eagles’ 13. On fourth down from the five, Brovelli plunged in for the touchdown. The extra point was blocked. The Eagles scored in the fourth but never further threatened the lead. Lot of ugly circumstances made for an equally ugly game. With only two days rest between games, traveling from Philadelphia back home, and facing a great Bears team, the Steelers didn’t stand much of a chance. Over 20,000 fans packed Forbes Field to see the Bears. More specifically, to see Red Grange, playing in his final season and enjoying his farewell tour. Derek Jeter before Derek Jeter. He saw the field sparingly but by all accounts was still impressive. Despite the Pirates likely being gassed, the way the Post-Gazette tells it, this was the most brutal contest of the season. Pittsburgh suffered three severe injuries, all occurring in the first half. Brovelli fractured his left shoulder, Rado broke his left collarbone – ostensibly after getting trucked by Bronko Nagurski – and Zaninelli tore ligaments in his right arm. It’s a good time to remind everyone NFL rosters only allowed 22 players, not the 53 like today. That makes 19 players for a half of play against one of the best teams in the league. Ouch. Literally. The home team had the first chance to score. All-star running back Beattie Feathers muffed a punt and Skladany fell on it at the 30. The drive didn’t go anywhere and to rub salt in the wound, Brovelli’s field goal was emphatically blocked, hitting one of the Bears’ lineman bursting through the line square in the chest. Feathers and the famous Nagurski led a long drive that resulted in a six yard touchdown pass. Feathers burned the Pirates again, dancing untouched on an 82 yard run in the second quarter. 14-0 Chicago. Cap Oehler attempted to keep the Pirates’ spirits alive with two interceptions himself in the third. 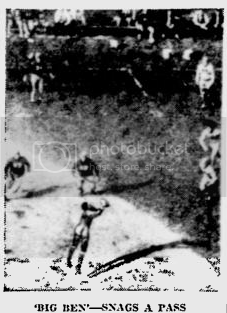 The latter allowed the Pirates to move to the Bears’ 26, including Heller finding Ray Tesser for 18, but a fumbled lateral gave it all away right after. Another red zone chance failed. Despite throwing for 32 yards on a drive, Heller threw over the head of Harp Vaughan on fourth down and the threat was thwarted. Vaughan was picked off and the Bears ran it back 38 yards to the four, setting up the third Chicago TD. The fourth occurred on what is described as a Tim Tebow-like “pop pass,” the QB jumping up near the goal line before flicking it over. The Bears turned the ball over seven times and still shut out the Steelers. The PPG also said Chicago ran for 420 yards but I’m not completely convinced their stats back then were accurate. With the blowout nature of the loss, the write-up was banished to the fourth page of the The Press’ sports section. At the time, it was the biggest win in Redskins’ history. If you can believe it, things actually started well for the Pirates. They picked up two first downs on the opening drive. Unfortunately, that was the highlight of the day. Blood McNally was picked with the ball brought back to the Pirates’ 28. Two plays later, Charley Malone hauled in a touchdown. McNally gaffed again, fumbling the ensuing kickoff, leading to another Boston score. Moments in and the Redskins were ahead 13-0. A 32 yard pass set up a Battles nine yard touchdown scamper, pushing Boston’s lead to 19 at the break. They didn’t let off the pedal with Ted Wright busting through for a 59 yard score early in the third. Two more Pirates’ interceptions led to a pair of Redskins’ touchdowns. The closest Pittsburgh would come to scoring was in the waning moments of the fourth, marching down to the opposing 20 before turning it over on downs. The Steelers were hindered without Warren Heller for much of the second half. He suffered a leg injury in the second quarter, attempting to return, but ultimately was unable to gut it out. On the bright side, McNally had an interception and Skladany’s defensive effort was referred to as “outstanding” by the PPG. 37 year old Kelsch received work out of the backfield, carrying three times for 12 yards. Must have been like Brett Favre running Lead Strong. Immediately following the game, Art Rooney announced Brovelli had been shipped to Boston. Well, staying in Boston. You know what I mean. No clue what Brovelli’s health situation was. He never played a down for the Redskins. 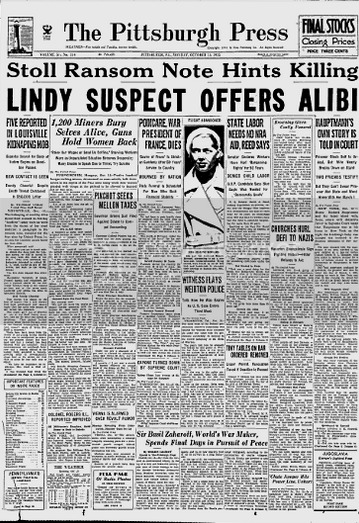 Football aside, the front page of The Pittsburgh Press headlined the Lindbergh kidnapping for you history/aviation buffs. 15,000 fans braved the rain to watch the Giants win, their tenth in a row. Ken Strong accounted for 10 of the team’s points. Idaho product Wee Willie Smith – I love these names – scored the other TD for New York. The Steelers’ only TD came with the game in hand. Bill Sortet caught a 21 yard touchdown from Harp Vaughan in the contest’s dying moments. It was a relatively close game though. The Giants led just 3-0 at the half. For whatever reason, the lowly Pirates played the G-Men tough in both games. Again, keep in mind this was a road game, leaving only a snippet of information in the Pittsburgh paper. The Pirates prove to be the elixir to the Dodgers’ three game losing streak. Jack Grossman got the Dodgers going with a 72 yard punt return touchdown in the first quarter. 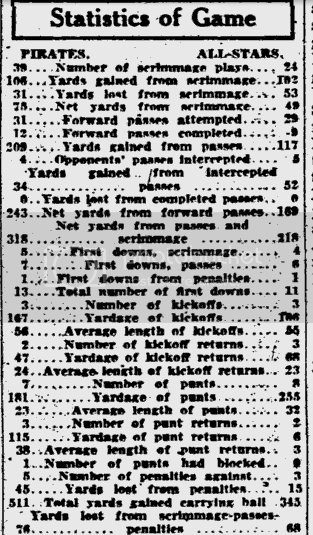 The Pirates cut into that deficit with a Niccolai 40 yard field goal, according to The Pittsburgh Post Gazette, though other records have this listed as a whopping 50 yard make. I find that a little unlikely. The Dodgers’ Wayland Becker picked off a Heller pass to set up the final score, a TD pass from Cliff Montgomery to Ralph Kercheval. It’s not getting any easier for the hometown team, falling to 2-8 and their fifth straight defeat. Before the Lions’ broke through, it was a see-saw punting matchup with the Pirates’ Ray Tesser getting the upper hand. But then the Lions broke through, driving 80 yards, christening it via a Joe Christensen dive inside the one. Believe it or not, the Pirates tied it up. The wording is archaic but when you tease it out, Vaughan hit Skladany on a 62 yard pass, the receiver racing downfield for the last 40 of it. The end is also praised for his effort on defense in the game. 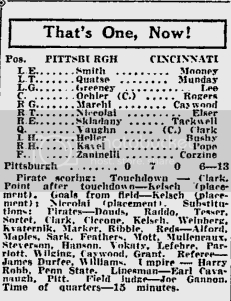 Another aside: Pro Football Reference organizes it as the Pirates scoring first but the newspaper account makes it clear it was the Lions. Granted, the paper isn’t infallible given the time period, but I’m going with their word. At the end of one, quarter it was a 7-7 ballgame. However, the Pirates’ offense was stuck in the mud the rest of the way, registering only four first downs on the afternoon and never getting the ball past midfield again. The Lions quickly answered the lone touchdown allowed. Dutch Clark reeled off a 45 yard run for the go-ahead TD. Vaughan was intercepted on the following drive. On the ensuing play, the Lions’ converted a 37 yard TD pass. 21-7 Detroit. Similar story, different quarter. Vaughanpicked, though there would be no need for the Lions’ offense. Ernie Caddel raced the INT the whole way back. 27-7. An ugly punt by Tesser on the next possession gave Detroit the ball on the Pirates’ 32. It led to another Caddel score. He did the same in the 4th, converting from 26 yards out. Of all the losses, this one was arguably the worst. The score doesn’t look like much, a one-possession defeat, but the circumstances tell a different story. The Gunners popped out of nowhere, taking over for the recently folded Cincinnati Reds’ franchise. They were a brand new team with zero holdovers from the Reds. League commissioner Joseph Carr was in attendance to watch the franchise’s first game. It came at the Pirates’ expense. Pittsburgh picked up a meager four first downs and only completed three of eleven passes. The Gunners’ attack was far from prolific but field goals from 35 and 12 yards out was enough to give them the edge. Over 13,000 watched the Pirates fall. This was all The Press cared to write about it. Hopefully you can see why the road reports are significantly shorter. Pittsburgh came home for the final game of the 1934 season. But the results weren’t better. Fans appeared to anticipate as such with a season low total of 9,000 at the gates. The Dodgers’ Ralph Kercheval scored all ten of the Dodgers’ points, all coming in the third quarter. He caught a 23 yard touchdown from Red Cagle – eluding several defenders in the process – and booted a 24 yard field goal. The touchdown, on fourth down, capped a 65 yard drive. Their Jim Levey, a former baseball player for the St. Louis Browns, propelled them with several explosive plays. Pittsburgh had two key chances. Peter Rajkovich ran for a couple of first downs and Heller found Smith for a completion, driving to the Dodgers’ 20. But then Rajkovich fumbled the ball away. Later, Armand Niccolai’s 40 yard attempt was short. Pittsburgh’s offense was slightly better, 11 first downs and 278 yards rushing. But they couldn’t cross the goal line. Again. 1934 ended with them scoring two touchdowns over their final seven games. Yikes. I believe what happened to poor Harp Vaughan sums up the game, and the season, well. A whole blurb dedicated to it? The PPG has no chill. In a unique situation, two Pirates became temporary Dodgers. Because of the team’s injuries, owner Shipwreck Kelly was granted permission by the league to bring tackle Jess Quatse and end Bill Sortet back to Brooklyn to play out the final three games of the regular season. In the hope of catching the Giants and playing in the championship game. For the record, the Dodgers would lose their next three, finish the season 4-6, and the Giants would win the 1934 title, defeating the Bears 30-13. The Pirates? 2-10, regressing from their 1933 record. Bonus game! The Pirates took on the All-Stars in a charity game two weeks after the season concluded. Just wanted to add a short snippet. Over 18,500 people braved the cold to watch. McNally hit Skladany on a touchdown while Heller ran in from five yards out. Rado found Heller to round out the professional’s scoring. Duquesne’s Art Strutt scored the only TD for the amateurs. He would go on to play with the Pirates in 1935 and 1936. The pros had a reported 435 yards rushing and the two clubs combined to attempt 60 passes, a very rare number for the time. The Pittsburgh Press has two clear photos from the game.